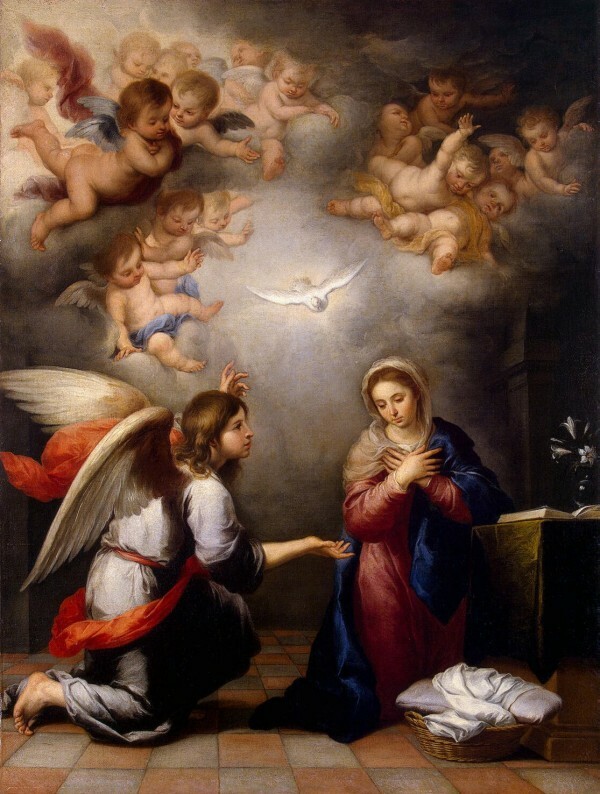 Tradition holds that Mary was in the midst of prayer when the Archangel Gabriel came with his message. At that moment, her mind, her soul, her heart, her very body, was prepared to receive. “Hail, full of grace,” he greeted her. It was her life of prayer that gave her the humility to listen, to trust, to be the reed of God and bend according to His will. Be it done TO ME. Are we willing to have God do things TO US, to change us, perhaps, from water into wine? Mary’s assent wasn’t dependent on the absence of confusion, but if you notice in scripture she asked questions not to challenge or argue, only to understand. “How can this be, since I have no relations with a man?” (Luke 1:34). And when she received the answers, she simply pondered them in her heart. We cannot trust Someone we do not know. Until we make the effort to get to know that Someone, we can only pretend. Mary’s willingness to be whatever God wanted her to be, the flexibility to allow herself to be molded, her receptivity to information, and the capacity to take all these things and bring them into the silence of her heart — that openness, as of a vessel, ready to be filled with wonder and grace… all these make possible her beautiful Magnificat. Not only was she open to receiving blessing and joy, she knew full well that with her fiat came the cross. She wasn’t being offered wealth, or fame, or comfort. For Christ cannot be separated from His Cross, and becoming Christ-bearer meant becoming Cross-bearer as well. The same is true for us. Mary may not have needed much pruning, but pruned she was just the same. Nevertheless she was a peaceful soul, even in the face of the unknown. Did she know that Christ would rise again? I think so, because she knew firsthand God’s power, she who allowed God the Son Himself to inhabit her womb. Not only was she mother, she was also disciple. We parents know that even as we teach our children, we too learn from them. Mary was a catechist then, and she is a catechist now, teaching us what she knew, by showing us how she lived. She teaches us women how to be spiritual and biological mothers at the same time that she teaches us how to be disciples. We use the word “radical” far too often today that we seem to have lost its meaning. But Mary had a radical, courageous faith, which made her a radical disciple. She may be almost wordless in the Bible, but she was a risk-taker who lived loud. Her mission was tied to her submission, and she entrusted God with everything — her youth, her dreams, her plans, her body. At the Last Supper, Jesus said, “This is my body which will be given up for you.” Mary gave up her body as well, so God could take flesh and enter history through her. In turn we too are called to let Christ take flesh in us, to become His hands and feet, to enter history again and again, every time we give our fiat. Originally published at Meet the New Eve.